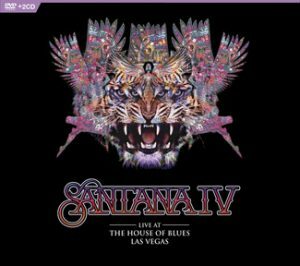 This 2 CD/DVD set features the reunited original Santana band from the late ‘60s/ early ‘70s. It was performed at the House Of Blues in Las Vegas. It features Carlos Santana (guitar, vocals), Neal Schon (guitar, vocals), Gregg Rolie (Hammond B3, lead vocals), Michael Shrieve (drums) and Michael Carabello (congas, percussion, backing vocals). Carlos Santana introduced the band and finally brought out Neal Schon. He credited Schon for being responsible for the reunion. Santana prove that they still have ‘it’ after all of these years. They need to have one more major world tour before calling it quits. (They only scheduled a very limited number of shows for their reunion.) Thankfully we can relive this concert over and over with this CD/DVD combo pack.